If you live within 2kms of the University, walking to campus is a great option. 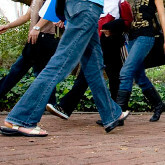 Walking keeps your body active and in shape and helps you arrive alert and energised. Walking also clears your mind and promotes a positive outlook. Walking is a low impact exercise and can reduce blood pressure. Being weight bearing, walking can also strengthen your bones. When the walking distance is too great to be convenient, combine walking with other transport modes to get the exercise we all need into our day. Remember, your body is designed for walking rather than sitting for long periods of time. On average we walk at 5 km/hr. At that speed we can often be ahead of congested traffic.